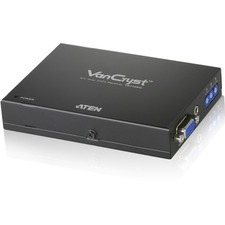 Extend an HDMI® video and audio over standard CAT5 cabling, with support for RS232 Serial and Infrared control. 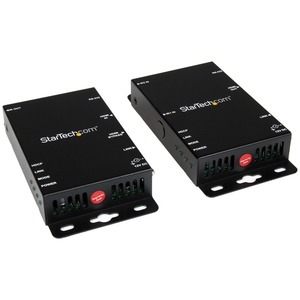 The ST121UTPHD2 HDMI® over Cat5 Extender Kit can extend the audio and video signal output from an HDMI®-equipped device by up to 330 feet (100 Meters), over a single CAT5 cable, or up to 165 Feet (50 Meters) over a single CAT6 cable. 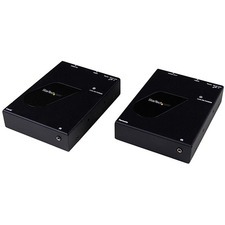 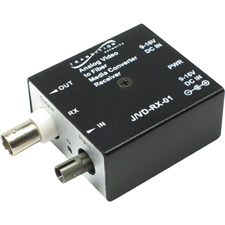 The extender supports full High-Definition video (1080p) and HD 3D, and also extends the accompanying digital audio signal.For convenient, time-saving control of the media source, the CAT5 HDMI extender offers bi-directional RS232 serial and Infrared (IR) interfaces, which enable you to control the HDMI audio-video source from either end of the connection.The HDMI over CAT5 Extender Kit includes both the HDMI® to CAT5 transmitter and the Cat5 to HDMI receiver needed for a cost-effective, ready-to-use digital signage solution.To help ensure seamless performance without any unexpected or unnecessary interruptions, the HDMI Ethernet transmitter and receiver units are fully compliant with High Speed HDMI® and HDCP standards, and each unit features lockable power connectors to prevent accidental disconnections.The ST121UTPHD2 HDMI over Cat5 Extender Kit is backed by a StarTech.com 2-year warranty and free lifetime technical support.